What do our Professional Tree Services Include? We do everything that has to do with trees. From full tree removal and stump grinding to trimming and caring for your trees. We can even plant new trees for you. All you have to do is give us a call and we will be there the take care of your tree care needs. One of our main specialties is the removal of trees. All trees eventually grow old and die, well except for Redwood trees that seem to live forever. When a tree dies it becomes necessary to remove that tree. We can safely remove large or small trees. Whether they are alive and unwanted or dead and even more unwanted, if you want a tree gone then call us. We also do stump grinding so that you are not stuck with an unsightly stump for years to come. Besides who wants to be left with a stump in their yard to trip over. And once that old tree is fully removed then we can plant a new tree either in its place or somewhere else in your landscape if you so desire. We also can remove unwanted shrubs or brush, including Oleanders. Do you have a tree that you love but are not quite so fond of its location? Well I have great news for you, relocating is also an option. Provided the tree is not too large, lets face it if we pulled a 50 foot tree out by its roots you would have an a hole to the center of the earth left behind, and that would only part of the problem. However, If you have a young or smaller tree that you want to keep but don't like where it is growing then we can often move it to a different location. We can also move some types and sizes of shrubs if you don't like where they are currently growing. Tree trimming is also an important service that we offer. Often times perfectly healthy trees will have branches that die. This can be caused by many different reasons including a particularly cold winter or pest. Removing the dead branches will help keep the rest of your tree health and strong for years to come. Trimming sick or dead branches can also help prevent disease from spreading through out your tree. Aside from trimming a tree's dead branches we can also provide the pruning that a tree needs to be healthy. Pruning is the removal of some of the healthy branches of a tree. Why would we remove seemingly healthy branches? Because some trees, including fruit trees, will grow many small branches which forces the tree to divide its nutrients among them. This creates many small weak branches instead of fewer strong branches. This can over time cause a tree to become sick and weak. A fruit tree that has not been properly pruned will not produce as much fruit as it otherwise would. For those of you with a beautifully manicured landscape, the shaping of trees and shrubs play an important roll in your yard and the way it looks. We take pride in being able to beautifully shape your trees to fit your needs and taste. 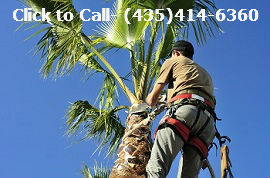 This includes our ability to trim and skin your palm trees to make them look neat and attractive. Regular tree care is an important part of our services. We know that a tree that is fertilized will thrive more than one that is not and we want to help keep the trees you love around as long as possible. We offer the fertilizing options that will help keep your trees looking their best. We can also fertilize your fruit trees so that they can produce at their best. Remember trees need proper nutrition as well. We also know that there are a lot of bugs and pest in St George and that they can harm our beautiful trees. Bugs can kill trees. Because of this we offer tree and shrub pesticide services. During the right time of the year we can also spray your fruit trees so that bugs don't make your delicious fruit inedible. We also have services to care for sick trees. We are what you might consider, a tree doctor. If a tree is struggling we will do our best to revive it and make it healthy once more. We even offer tree staking for trees that are in danger of falling or splitting, provided they are not too big, but we will be the judge of that and would be happy to have a look at any tree that you are concerned about. We are certified arborist. So you can rest assured that we know how to best take care of your trees. As our good friends at Northwest Tree Pros have stated "An Arborst brings an enhanced and unique level of skills and expertise to the table." You just can't beat having a professional take care of your trees. Trees are a wonderful asset to any home and you don't want to risk their health by using guess work in their care. Trust us, trust the professional certified arborist, when it comes to your trees' needs. You won't regret it. 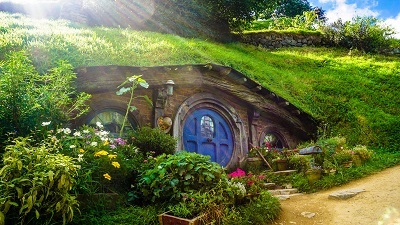 Because you don't have to live in a Hobbit Hole to want a beautiful landscape.